Our vision at Morgan’s Wonderland is to establish a special place where smiles and laughter make wonderful memories with family members, caregivers and friends. 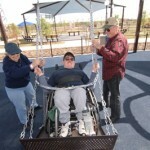 To build a place where the common element of play creates an atmosphere of inclusion for those with and without disabilities, encouraging and allowing everyone to gain a greater understanding of one another. 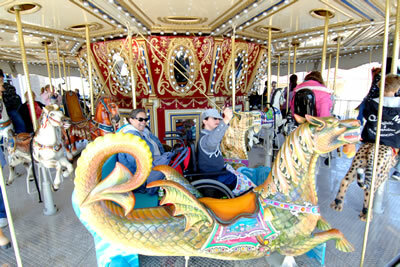 A Mecca of merriment for anyone with cognitive or physical disabilities, as well as able-bodied family and friends, your day at Morgan’s Wonderland begins in the parking lot, where there’s an abundance of accessible parking, including lots of spaces to accommodate wheelchair vans. From there, you’ll head to the Welcome Center—the gateway to your accessible excursion! You’ll have a hard time deciding where to start! 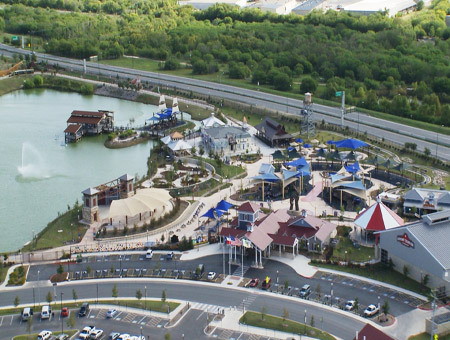 Sensory Village is an interactive world with themed spaces that lead to imaginative play and one-of-a-kind sensory adventures, like the Fix-it Shop, where guests can design a custom car and take a simulated test drive through San Antonio. The Village Market Grocery Store is full of colorful fruits, vegetables, and groceries, and two village “equicizer” horses (think gentle mechanical bull riding!) let guests experience the delights of horseback riding. There’s more in the village you’ll have to discover on your visit! 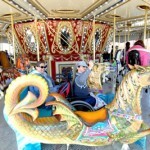 Take a trip on the Wonderland Express—a 1930s-style train that pulls cars equipped with wheelchair-accessible ramps, so everyone can enjoy the ride around the park’s eight-acre lake. Whoo! Whooooooo! 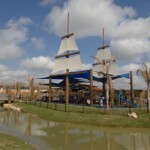 This “round-the-world” journey chug-chugs by themed rest areas, each one showcasing the scenic beauty and sounds of Italy, Japan, Mexico, Germany, Africa and the Caribbean—a haven for pirates centuries ago. Ahoy, Matey! 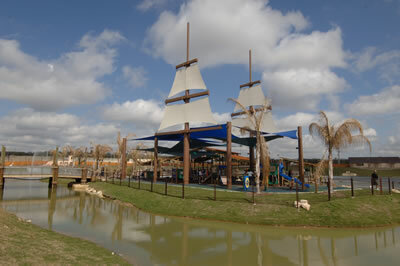 You’ll have to cross a bridge to get to Pirate Island Playground, where a fully accessible playscape awaits. A mighty sailing ship lets young and old alike set off for an unforgettable Seven Seas adventure. All you need is the wind beneath your wings. Back on land, if the Off-Road Adventure ride sounds like a lot of fun, wait ‘til you’re actually there! 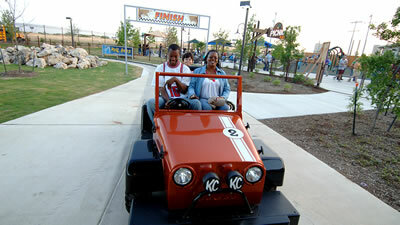 The accessible off-road vehicle follows a track teeming with twists and turns. Who drives is entirely up to you! Looking for a more leisurely experience? Head to the park’s rustic Fishing Wharf for a tranquil afternoon of angling on the 8-acre lake, brimming with catfish, largemouth bass, crappie and perch ready to bite that bait. All fishing tackle, bait and fishing assistance is provided free of charge to visitors, but you can bring your own gear if you prefer. 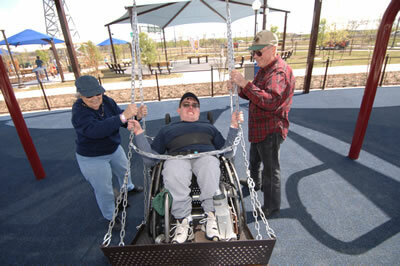 After you hook the catch of the day, stay high and dry with a stop at the Traditional, Adaptive and Wheelchair Swings. That’s right! Everyone swings at this perfectly planned swing site, where more than 30 swings—and a cool breeze on your face—await. Did those attractions pique your interest? There’s more to explore! Other attractions include the Music Garden, Sand Circle™, Walk & Roll Path, Butterfly Playground, Water Works, and a gigantic carousel. Celebrating something special? 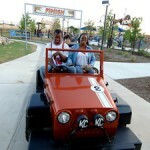 Morgan’s Wonderland has spacious, accessible venues for birthday parties and special events. Visit their web site for all the delightful details! And here’s the best part—individuals with special needs and children under two are always admitted free! Bring a camera and a smile. Making friends and playmates happens magically at Morgan’s Wonderland!